A name prevalent in the Bazalgette family is Willoughby. In fact it is one of my middle names. I received it in honour of my uncle, Ian Willoughby Bazalgette, RAF VC DFC. The first Bazalgette to bear the name was my great-great uncle, Willoughby Bazalgette (1857-1900) who was one of the sons of my great-great-grandfather Sir Joseph William Bazalgette (1819-1891) the civil engineer. I have two quite separate theories on how the name entered the family. The first, and to my mind the most likely, is this: Sir Joseph’s father, also Joseph William, served in the Royal Navy during the Napoleonic wars. The colourful Sir Nesbit Josiah Willoughby, the ‘Hero of Mauritius’ also did so, with distinction (coupled with controversy). 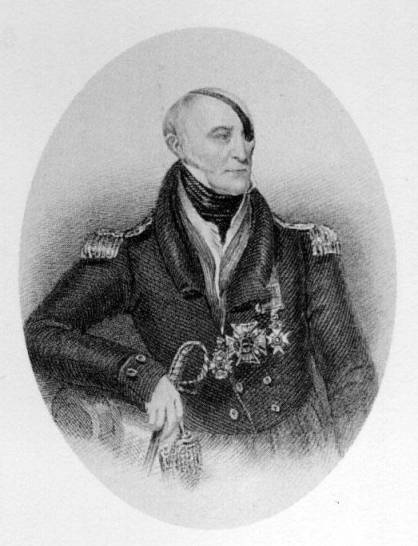 Naval records show that they never simultaneously served on the same ships, although they were both granted pensions on the same day – 2 December 1815 – and both at times served under Sir Josias Rowley. However, as the war progressed there were increasingly larger numbers of officers who fervently embraced Christianity, probably as a result of their war experiences. Their evangelism was sneered at by many and they were given the slightly derogatory name of ‘Blue Lights’. Prominent amongst them was Admiral James ‘Dismal Jimmy’ Gambier. Joseph William was an admirer of Gambier and they were members of the same benevolent societies. These were (amongst others) the Naval and Military Bible Society, of which Joseph was appointed an honorary secretary, the Sailors’ Home Society, the British and Foreign Sailors’ Society (of which Elizabeth Fry was a founder member), the London Society for Promoting Christianity amongst the Jews, the Seaman’s Floating Church, the Royal Naval Female School and the Association for the Suppression of Duelling. Newspaper reports show that Admiral Willoughby and Joseph both attended a same meeting of this last society. So Joseph knew and esteemed, and was apparently esteemed by, many of the most senior naval officers of the time. Willoughby had also embraced evangelism and produced at his own expense a religious tract (Extracts from Holy Writ, and various authors, intended as helps to meditation and prayer: by Sir N.J. Willoughby). So here we have Joseph and Willoughby sharing common beliefs and moving in the same circles. What is significant is that Joseph believed in honouring those he admired by naming his children after them. Joseph named his next son, born on the 7th April 1829, Henry Gambier Bazalgette, after Admiral Gambier. The child was christened at Marylebone Church on the 18th July. The boy died before he was two, and was buried in Paddington Church Cemetery on January 25th, 1830. Joseph had no further surviving sons but it is quite likely that he wanted to honour Willoughby in the same way. Perhaps it was his dying wish that his son Joseph would name one of his sons after the great man. That is one theory. The other is a possible family connection between my family and the Willoughbys. I remember my grandmother saying that is was an Irish name – it is not, since they are a Nottinghamshire family, but the supposed relationship comes from the line of my great-great-grandmother Maria Kough, wife of Sir Joseph Bazalgette, who was herself Irish. Her line can be traced back to Goff and Whalley, two of the ‘regicides’ responsible for the signing of Charles I’s death warrant, who were cousins of Oliver Cromwell. Henry Whalley is supposed to have married in c.1439 Dorothy, the daughter of Sir Hugh Willoughby and his second wife Margaret Freville. Another source, which looks more reliable, says that Dorothy married Thomas Thurland. The Visitations of the County of Nottingham do however show a family connection between the Lords of Willoughby and the Whalley family. Whether my great great grandmother Maria was aware of possible Willoughby ancestors is not clear but it seems a little tenuous to suppose that she named one of her sons Willoughby on that basis. Of course it may have been on a whim – who knows? 4 Responses to WHENCE WILLOUGHBY? Also interesting to me is that your naval ancestors were close to Admiral Gambier. For it was forcing the court marshal of Admiral Gambier that set Captain Cochrane on his slow path to ruin. I posted an article about Cochrane’s trial at the Redingote last month, and though I did not mention Gambier by name, he was one of the highly placed men in the Admiralty who felt great enmity towards Cochrane. What a small world! Thanks for your feedback, Kat. Yes, it is quite possible that my gggmr was an Austen enthusiast, though naturally I prefer to dream that my first theory is correct. I must see if I can find a christening record for the son Willoughby – possibly the admiral was invited to be godfather. That would clinch it. Gambier may have had qualities as a Blue Light but he was an ‘old school’ naval officer, and through his unwillingness to take decisive action in battle he was bound to clash with Cochrane. Again – thanks for your insight! I have to admit, I always thought Jane Austen’s Willoughby was rather a weasel, so I hope your first theory is correct, too! I’m glad you said it…. I NEARLY DIDN’T MAKE IT…..